304 stainless steel custom Z-Channel 2B finish is a mill finish, which is smooth and NOT the brushed finish commonly seen on kitchen appliances. 304 stainless steel custom Z-Channel 2B finish is light gray in color. 304 stainless steel custom Z-Channel 2B finish may or may not have a protective film on one side to prevent scratching. Customers can contact the sales department to see if the custom Z-Channel 2B finish has a protective film on the material if needed; however, if a clean, non-scratched finish is desired, the #4 brushed finish will have a protective film every time. Unlike structural, extruded Z-Channel, our custom Z-Channel will be cut to your specifications and bent in a press break. Therefore, our custom Z-Channel will give customers more variety of fabrication options, including a wide range of bending angles, hemmed edges (on thinner gauge material), flange options, uneven leg sizes, etc. 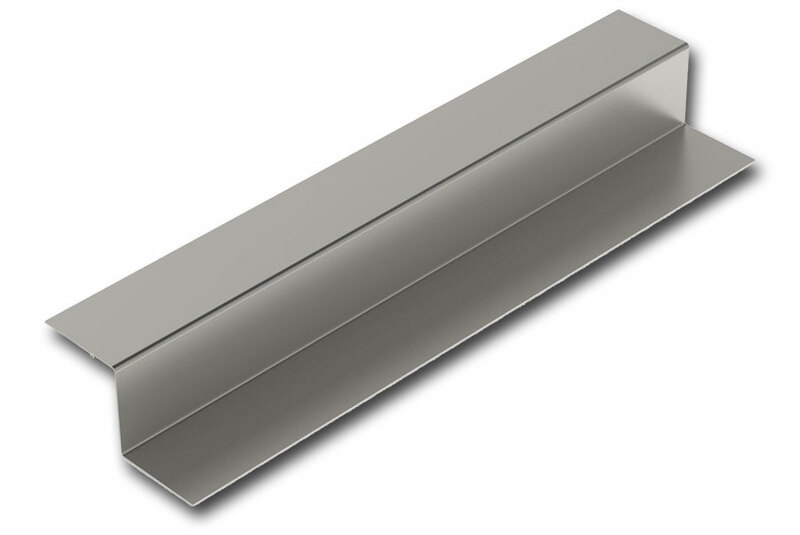 On our custom Z-Channel made out of material with a finished side, Stainless Supply also offers the choice of which side the finish side is placed on the custom Z-Channel, which can be selected in Step 2 of the Cost Calculator. For #4 brushed finish, #8 mirror finish, and Bright Annealed (BA) finish stainless steel, the finished side will have a protective film on it to help prevent scratching until the product is delivered. Currently, Stainless Supply can offer up to 120" (10 foot) lengths of custom Z-Channel. In terms of shipping, UPS and Fed-Ex ground will not take packages over 9 feet in length (including packaging). Therefore, anything over 96" (8 feet) will be rated as a freight shipment after adding it to the shopping cart and typically the shipping price will be higher than ground orders. If you have any questions about freight shipments, please call our office at 877-484-0088. 304 stainless steel custom Z-Channel 2B finish is a mill finish, which is smooth and NOT the brushed finish commonly seen on kitchen appliances. 304 stainless steel custom Z-Channel 2B finish is light gray in color. 304 stainless steel custom Z-Channel 2B finish may or may not have a protective film on one side to prevent scratching. Select Radius 1/8" 3/16" 1/4" 5/16" 3/8" 7/16" 1/2" 5/8" 3/4" 7/8" 1"
Stock Lengths: Select One 48" 96" 120" 144"
Do you prefer the grain run the length? Would you like to receive a scaled measured drawing for approval before we fabricate? For stock or shear cut to size orders, typical lead time is 6 days. For laser orders, typical lead time is 11 days. All shear cuts are guaranteed to be ± 1/16". All laser cuts are guaranteed to be ± 1/64". A custom angle setup charge of $27 per thickness will be applied in your cart.